The Vilar Performing Arts Center (VPAC) welcomes the hilarious political satire group Capitol Steps on Wednesday, January 13 at 7:30 p.m. It’s time to put political differences aside and enjoy the musings of the only group in America that attempts to be funnier than Congress. No elected official is off limits. These former congressional and Senate staffers satirize today’s political headlines and headline makers with humorous song and dance. Always fresh and crisp – no two performances are alike. Tickets are $58 and are on sale now at the VPAC Box Office (970.845.8497/ www.vilarpac.org). The VPAC is located under the ice rink in Beaver Creek Village (68 Avondale Lane, Beaver Creek, Colorado). Capitol Steps began as a group of Senate staffers who set out to satirize the very people and places that employed them. The group was born in December 1981 when some staffers for Senator Charles Percy were planning entertainment for a Christmas party. Their first idea was to stage a nativity play, but in the whole Congress they couldn’t find three wise men or a virgin. So, they decided to dig into the headlines of the day, and they created song parodies and skits which conveyed a special brand of satirical humor. In the years that followed, many of the Steps ignored the conventional wisdom (“Don’t quit your day job!”), and although not all of the current members of the Steps are former Capitol Hill staffers, taken together the performers have worked in a total of 18 Congressional offices and represent 62 years of collective House and Senate staff experience. 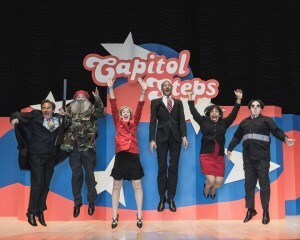 Although the Capitol Steps are based in Washington, DC, most of their shows are out-of-town or for out-of-town audiences, whether it’s the National Welding Supply Association, a University audience, High Schoolers, or State Legislators. In fact, the Capitol Steps have performed for the last five Presidents. The only complaints the Steps seem to get are from politicians and personalities who are not included in the program!